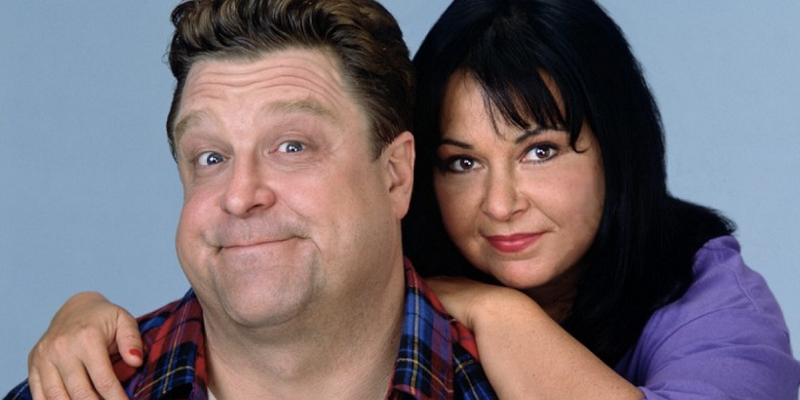 You’ve probably heard that Roseanne is coming back to TV. If you were either too young or too highbrow to have watched the series during its original, nine-season run on ABC, you may not realize why this eight-episode revival is good news. Let it be known: Over the course of the series, Roseanne (the character) and Roseanne (the comedian who played her) repeatedly went to bat for the LGBT community. And it’s all the more remarkable that it happened on a show depicting working-class Americans. 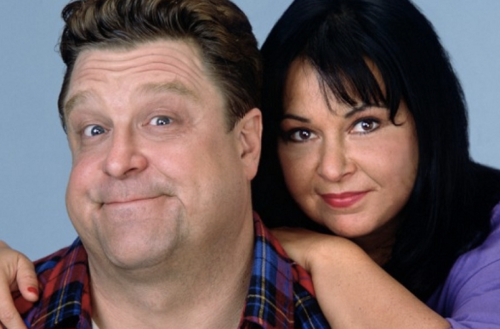 Just this week, it was announced at the ABC upfronts that the revival would feature the entire core Conner clan: Roseanne, Dan (John Goodman), Jackie (Laurie Metcalf), Darlene (Sara Gilbert), D.J. (Michael Fishman) and Lecy Goranson (Becky), with Sarah Chalke (Becky No. 2) returning as well, though playing a different character. And it was well-timed, too. The show’s final season concluded 20 years ago this week: on May 20, 1997. In celebration of that milestone and in anticipation of the forthcoming new episodes, we wanted to take a deep dive into one of the show’s gayest episodes. Is it possible to disconnect Roseanne the TV character and Roseanne, the show named after her, from Roseanne the real-life person, the once-and-future presidential candidate and espouser of controversial political theories? Even if you personally can’t, you have to admit there are still some good things to say about her LGBT activism back in the 1990s, before other family-centered shows were willing to tackle such issues. And one of the best episodes the show ever did was the 1992 installment “Ladies’ Choice,” a.k.a. the one where Nancy comes out. Of course, this episode is far from the only point to start a discussion about LGBT themes on Roseanne. There’s also Leon Carp (Martin Mull), Roseanne’s boss turned adversary turned buddy. There’s the sixth-season Halloween episode, “Skeleton in the Closet,” in which Roseanne suspects that Jackie’s husband, Fred (Michael O’Keefe), may be gay. And probably most famous of all, there’s “Don’t Ask, Don’t Tell,” the episode in which Roseanne visits a lesbian bar and gets kissed by Mariel Hemingway. However, this writer thinks “Ladies’ Choice” might have the most interesting bits, especially considering where the show would eventually go and what became of the actors who appear on it. In “Ladies’ Choice,” Nancy (Sandra Bernhard) comes out in the cold opening. In doing so, she may well have become the first openly lesbian recurring character on an American sitcom. What’s interesting about the writers’ decision to make Nancy a lesbian is that she’d previously been a romantic interest for Dan’s friend Arnie (Tom Arnold), and there had never been any hint of her being anything other than hetero. As a result, Roseanne and Jackie are stunned. Writers Betsy Borns and David Raether did a good job showing Nancy as being nervous and vulnerable as she reveals this news to her friends, but they also keep the exchange well within the tone of the show. As you can see in the below clip, Nancy breaks the tension by joking about Jackie being gay too. This a family that communicates through wisecracks, after all, and Nancy’s revelation is a shock but not enough to warrant “very special episode” treatment. Essentially, everything is still normal despite Nancy’s sexuality. Things get more interesting after the opening credits, when Roseanne and Jackie return home to talk about Nancy. Darlene walks in and asks to know who’s gay. Of course, the scene plays differently today because the actress playing Darlene herself came out in 2010. (Gilbert would later say she realized she was gay while she was dating Johnny Galecki, her love interest on the show.) When Darlene insists on knowing who’s gay, Roseanne decides to explain homosexuality to Darlene. The response is awesome: “Mom, I pretty much already know about lesbians, and what I don’t you’d be too embarrassed to tell me.” Foreshadowing is fun! For what it’s worth, Darlene is also surprised that Nancy is a lesbian, but the tension is once again diffused with a joke about the d-word — “dyke,” in this case. Given that the episode aired in 1992, you have to imagine that the show probably had to fight to use this word in primetime. It’s weird today to hear it slung around so casually. In the second clip, Jackie points out that sleeping with Arnie could be enough to turn any woman gay, before she catches and corrects herself with “some women.” The joke here is that Jackie herself once hooked up with Arnie. Jackie’s overall lesbianishness comes up throughout the episode. In the below clip, Roseanne remarks that Nancy doesn’t look like a lesbian, because “lesbians are big ol’ truck drivers that wear flannel shirts and faded jeans.” They both laugh—then Jackie catches herself again. She is wearing a flannel shirt and faded jeans, and she has worked as a truck driver. In the final moments of the very weird final season, Roseanne reveals the show to have been a narrative that she had been writing all this time. She also admits to modifying the real-life events. In reality (or the reality-within-the-reality), Jackie is a lesbian, and it’s interesting to think of a demonstrably heterosexual character to always seem a little gay, Chandler Bing-style. In real life, Roseanne has a gay sister and brother. Given where her character ultimately goes over the course of the show, there’s a similarly meaningful scene at the end of “Ladies’ Choice,” in which Roseanne and Jackie tell Beverly that Nancy is gay. Beverly assumes she’s being pranked, and in a characteristic overreaction, she jokingly comes out herself, four years before she would for real. 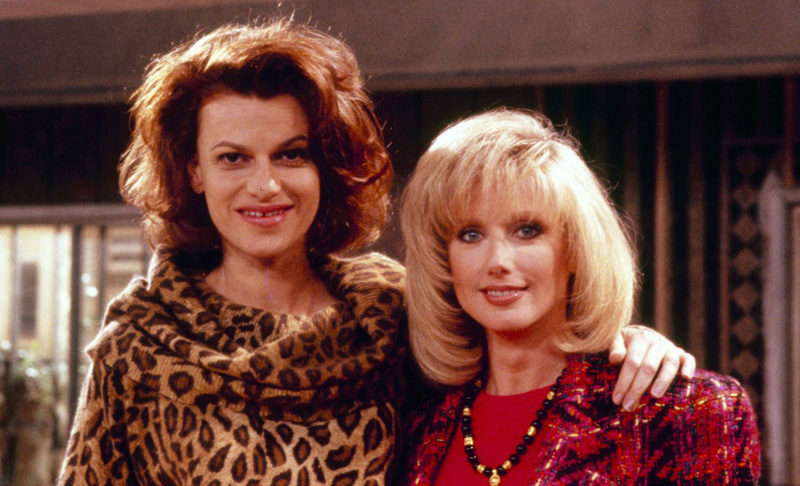 Finally, there’s Marla (Morgan Fairchild), Nancy’s new girlfriend. On a show where most of the female characters drape themselves in flannel and denim, Marla is notably feminine. In fact, she met Nancy at the make-up counter at a department store. Just as it’s a learning experience for Roseanne to find out her friend Nancy could be gay, it’s also important that she meets Marla only shortly after she made a joke about all lesbians being stereotypically unfeminine. Today, there’s a sense that TV should represent the full diversity of the LGBT community and Orange Is the New Black gets praise for introducing Lea DeLaria’s proudly butch character. In the context of the episode, Fairchild’s casting works well just to needle Roseanne toward revising her preconceptions about how a lesbian should look and act. It might have also accomplished that for viewers who didn’t know happen to know any real-life lesbians. Two episodes pervious to “Ladies’ Choice,” April O’Neil herself, Judith Hoag, appears as Kerry, Nancy’s never-before-seen, never-again-seen friend who advises Roseanne and Jackie on how to get a loan. I’m willing to bet Hoag may have been intended as Nancy’s first girlfriend before the show snagged Morgan Fairchild for the role. Fairchild stuck around for three episodes, and Nancy was subsequently paired with both Mariel Hemingway and Tim Curry at various points, because mid-’90s, TV-watching America also needed to know about fluid sexuality. Roseanne told stories about average Americans getting by and laughing at whatever troubles came their way. As a result, it made for a surprising vehicle for progressive values. But it worked, and because Roseanne and her family reacted to most situations with a shrug and wisecrack, they treated homosexuality exactly the same way. It’s just another part of the American experience. Among all the episodes of Roseanne that death with LGBT issues — or at least how straight people deal with LGBT issues – I think this one is the most interesting. There’s a lot to discuss regarding the one where Roseanne kisses Mariel Hemingway, sure, but this one came first, this one dared to out a familiar character and this one is the one where the Conners revealed themselves to be people who ultimately didn’t really care if someone was gay or straight.